Finishing in a highly creditable 12th position and beating his closest championship rivals at the final round of the World Enduro Super Series in The Netherlands, Rockstar Energy Husqvarna Factory Racing’s Billy Bolt has become The Ultimate Enduro Champion 2018. 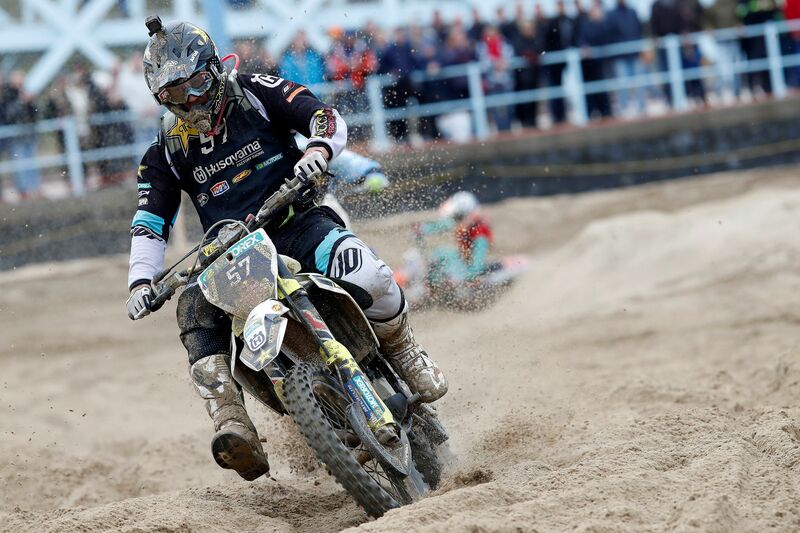 Finishing third at Knock Out, Yentel Martens rounded off a hugely positive day for the Rockstar Energy Husqvarna team. WESS championship leader coming into the final round of the series, Bolt did exactly what he needed to do at Knock Out and delivered one of the strongest performances of the WESS regulars. Comfortably through the morning one-hour qualifying race, he knew that while he had one hand on the championship he still needed to complete the two-hour race and ensure a solid haul of championship points. Well positioned from the start, Bolt did his best to match the pace of the eventual podium finishers. Not pushing too hard so as to make mistakes, he completed the first half of the race with no issues. During the second half of the event the soft, unpredictable sand got the better of the Had Enduro specialist as two big crashes saw him part company with his FC 450. Despite twisting the front end of his bike, Billy charged his way through the final 45 minutes of the race to place 12th and with it become the first ever World Enduro Super Series champion. Ending his participation in the 2018 World Enduro Super Series as winner, Billy’s WESS campaign started with victory at Extreme XL Lagares, in Portugal. Enduring more than his fair share of ups and downs during the championship, as well as a mid-season knee operation, Billy’s podium results during the closing stages of the series – Megawatt in Poland and the Hawkstone Park Cross-Country in England – ultimately put him in the championship driving seat ahead of the final round. Delivering the Rockstar Energy Husqvarna Factory Racing team’s best result at Knock Out was Yentel Martens. Using his sand racing skills to good effect, the Belgian put together a mistake-free race to finish a well-deserved third. One of only three riders to complete 24 laps around the gruelling track, Yentel stuck to his game plan of keeping away from trouble and not making any mistakes during the opening hour of the race before pushing hard to the finish. Battling his way to the finish of Knock Out in 28th position, Alfredo Gomez completed 19 laps.